Paros is at the heart of the Greek archipelago, which has been the cradle, the vital space, the inspiration, of all Greeks throughout the world and throughout history. 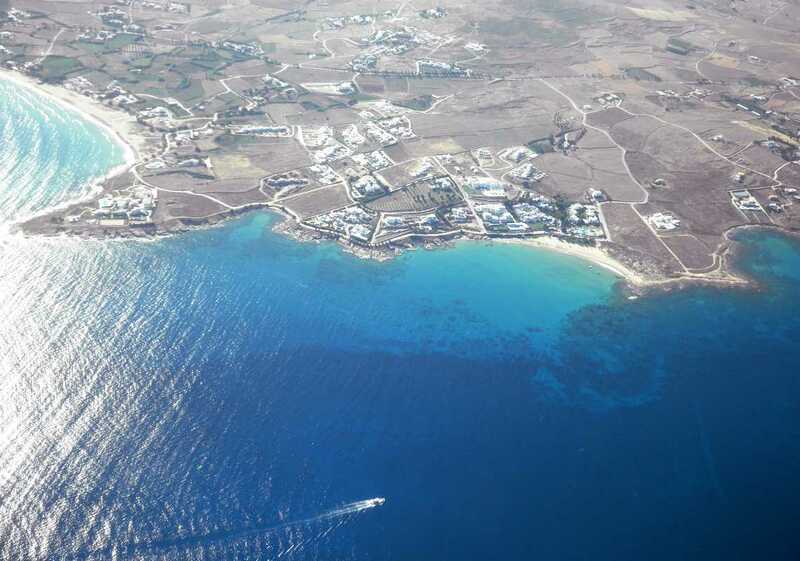 Paros Island presents a great place to visit for private pilots. This last one has been a very long winter! As a Greek, I expect winters to be mild and pleasant, with many warm, sunny breaks, to enjoy wine and fresh fish by the seaside. Not this time! This last winter was ridden with cold, wind, water in the atmosphere in all forms and vitamin D deficiency. Needless to say, with this kind of MET, if it weren’t for the fast approaching summer, I would be No.1 for risking my PPL(A), by spending too much time on the ground. So, the last few days I have been looking at my charts, making plans for quick getaways and much deserved long weekends. For a number of reasons, primarily due to free, luxurious accommodation (that’s what friends are for), Paros remains on top of my list for many years now. The island of Paros belongs to the Cyclades group of islands, in the middle of the Aegean Sea in Greece. Like all major Greek islands, it has a long history, but is mostly known for the extraction of exceptionally white marble, which has been used for famous statues like Aphrodite (Venus) of Milos, Hermes of Praxiteles and Nike of Samothrace. Nowadays, Paros antagonizes the not-so-distant island of Mykonos, on hospitality, night-life, as well as water-sport events, like wind-surfing and kite-surf. The crystal clear waters, the diversity in coastal scenery, the culinary tradition, as well as the multitude of options for a good night out, can make a two-day break very rewarding indeed. So, rather than having to get to the nearest port, queue up to get my ticket and spend a few hours on a boat to get there (which I often do travelling to islands without an airport), I find it is much easier to get to the airclub at Tatoi (LGTT), on the NW suburbs of Athens, have a cup of coffee, while I look at NOTAM’s, METAR, etc., before casually walking down the paved pathway, to my C-172P for a thorough pre-flight inspection. On the GA apron of LGTT (Tatoi). The facilities of the airclubs on the right-hand side and a historic plane hangar on the left. The mountain behind is called Parnitha, with a peak at 4570ft and is home of our glider pilot friends. Our planes are C-172P. Taking off from a military airfield (home of the Hellenic Air Force Academy) means you have to make sure well in advance that it is open for GA operations. It is 99% of the time and it isn’t when you and your friends or a lady you’re trying to impress are all geared up for a great weekend on an island. Still, the rewarding moment is when you take off from RWY21 and you are already admiring the Saronic Gulf stretching south of Athens and into the vast blue of the Aegean Sea. 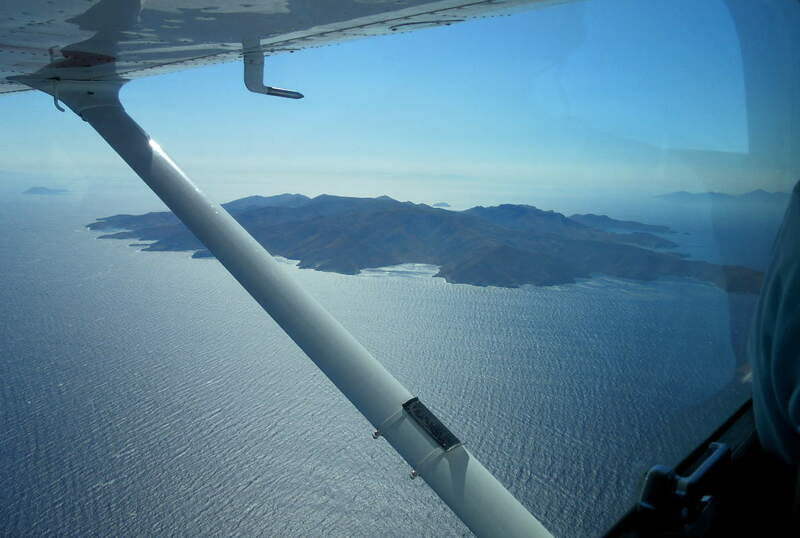 We have just left the coast and are now flying over the Saronic Gulf, towards the island of Aegina. Looking back, the city of Athens and Parnitha, the big mountain in the far background. 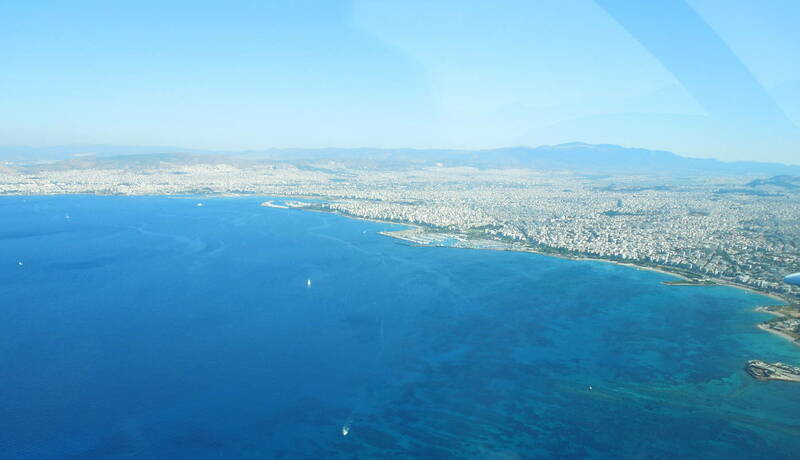 Carefully avoiding airline traffic, flying well below 2,000ft (1,000-1,500ft) and keeping clear off the eastern part of Athens, where the Athens International Airport is located, we slowly make it to the island of Aegina. From that point on, navigating VFR literally has to do with identifying islands. 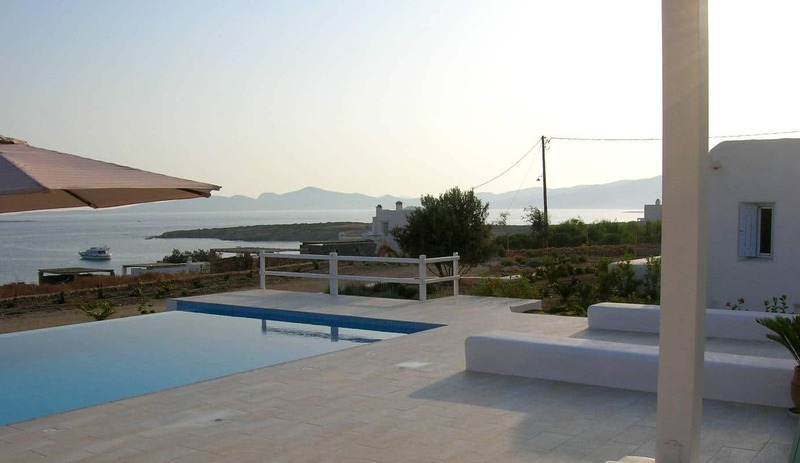 So, from the luxurious villas on the eastern side of Aegina (yes! those with the swimming pools on the edge of the cliff at 700ft AMSL) we move on to the island of Agios Georgios (Saint George). This long and narrow island, with its newly acquired wind-turbines, is the last reference point for the next 35nm. 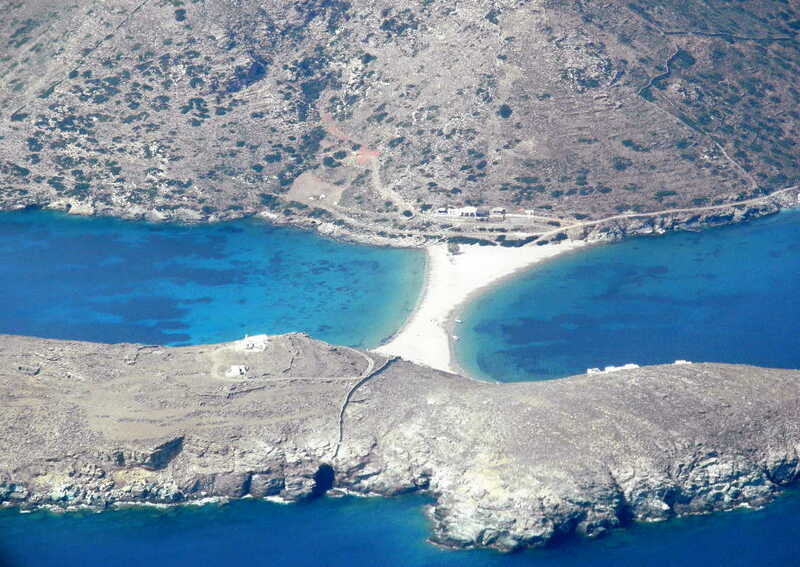 The island of Agios Georgios. The road on its ridge is used for the construction and subsequent operation/maintenance of the massive wind turbines. A potential spot for emergency landing in the meantime. Hot weather in Greece usually means that vaporized sea-water creates a veil, which turns everything blue over the Aegean, so that the sea and the sky merge and the horizon becomes somewhat vague. So, although it is a VFR flight, you need to strictly maintain a 129º track or you will be way off your mark, before you can spell S-e-r-i-f-o-s, which is the next island on the way. All going well, 20 minutes later you are at SOREV, a VFR/IFR point just off the SE coast. Despite being a relatively small island, Serifos has an impressive number of remote beaches and little gulfs that can only be approached by foot or boat, so it is a great privilege to have all of them in panoramic view. The island itself is the opposite of cosmopolitan, so there you learn to enjoy the simple things in life…like having a beach to yourself. The western coast of Serifos and Antiparos in the far distance on the right. On a 092º heading, with Serifos to the north and Sifnos to the south, you enjoy the view of little gulfs disappearing behind the mountains of the islands (1914ft and 2238ft respectively), and new beaches appearing on the other side of the coast. The tiny villages on top of those mountains, some of them abandoned, some with just a handful of elderly Greeks, remind you of their necessity at times, when piracy was very common in these waters and people would run to those naturally fortified locations to protect themselves from the attacks of Corsairs. 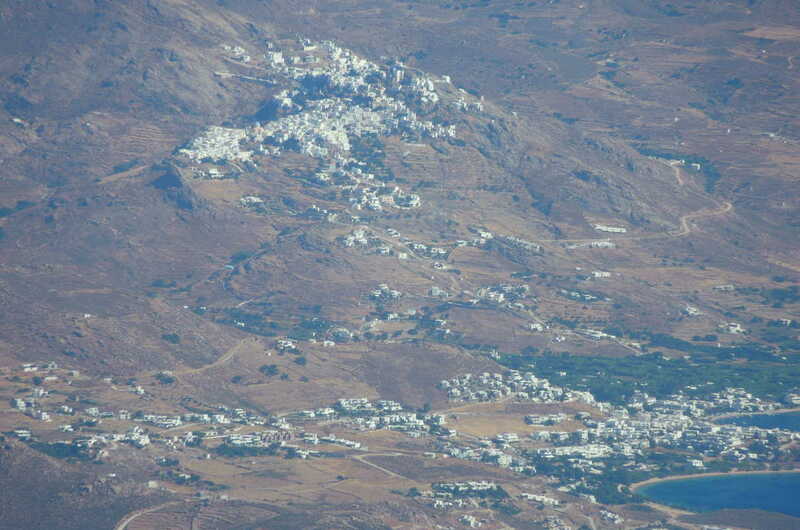 The town of Serifos is carefully not located close to the coast. Roughly 20 minutes and 32nm later, you enjoy the splendid view of Paros and a few miles to its west Antiparos (literally meaning counter-Paros). 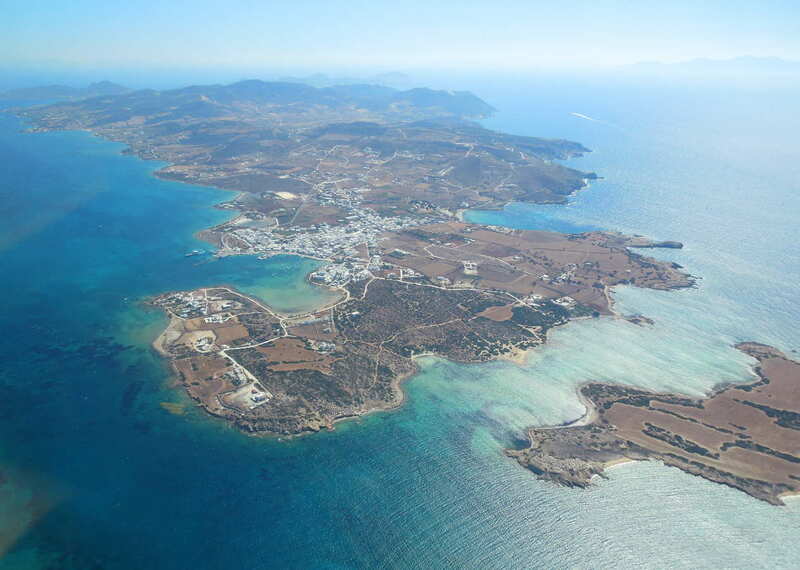 The island of Antiparos, looking South-SE. The shallow water between the two islands makes the sea look like a massive swimming-pool. After July, when the northerly winds of the Aegean become so strong that they make the church bells chime, it is time for the world’s top surf athletes to try themselves in this channel. It is considered one of the most demanding testing areas globally and competition is strong. 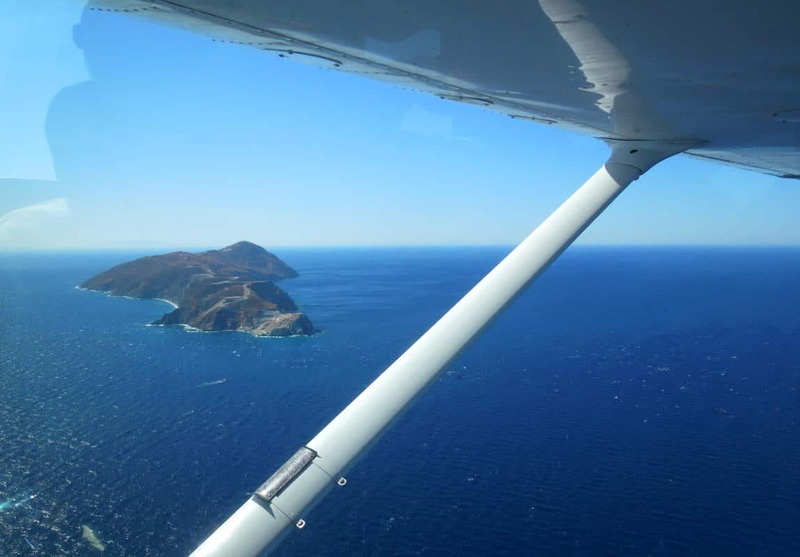 However, around this time of the year (spring/early summer) the winds are hardly affecting the flight, which is just fine since after passing Antiparos, we are descending to 1,000ft AMSL to join the circuit and land. 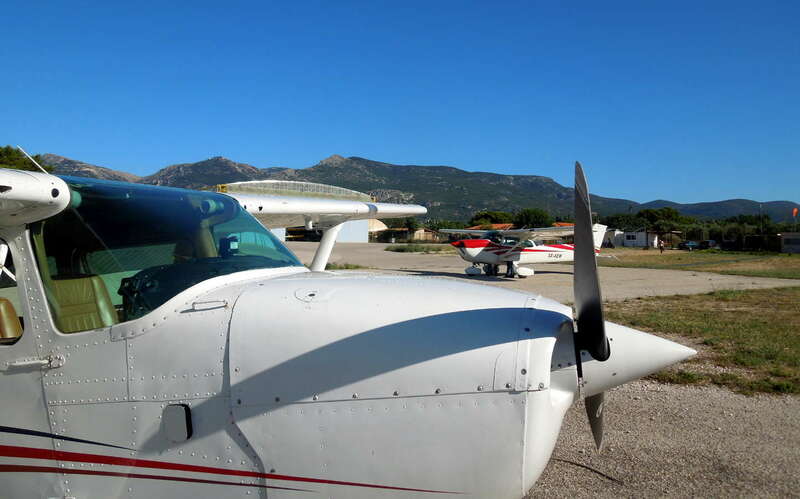 The aerodrome is located on the SW tip of the island and the colour of the tarmac blends in perfectly with the colour of the surroundings, especially before the grass gets too dry and yellow. Hence, it has not been uncommon for pilots to have to fly almost over it before they have the runway in sight. If RWY 35 is in use, you can just follow the SW coastline until you reach the most prominent gulf in the area (Alyki) and then, as you turn north, you’re already on final and should have perfect view of the runway. Gusts are not uncommon; neither is turbulence occurring from the 2,499ft mountain to the NE; neither are go-arounds due to the relatively short runway and lifting currents that occur from the tarmac getting too hot under the burning sun. Especially if RWY17 is in use (the downhill one) you could be testing your nerves, flying with zero descent, steadily at 10ft off the ground, nose pointing up, all the way from the threshold, down to roughly 2/3 of the runway length…and it still won’t land(! )…and the end is approaching followed by the earth’s steep decline to the beach and ultimately the sea. Backtracking to the apron, you open the window and the salty sea breeze cools off your salty red face. The always cheerful, yet highly professional people on ground and on the tower welcome you and you genuinely feel blessed to be there. 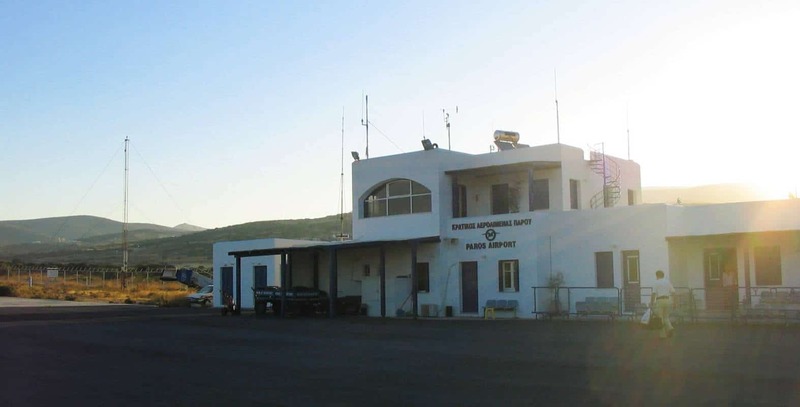 The Paros AFIS is located on the side of the apron, in a building that has the traditional aesthetic and architecture found in the Aegean. Snow white, with blue doors and windows, it matches perfectly to the scenery. The moment you walk through those doors, you know you have entered a different world. You are now at the heart of the Greek archipelago, which has been the cradle, the vital space, the inspiration, of all Greeks throughout the world and throughout history. After a few days on the island, it is natural to turn your head and look back in nostalgia, making a promise to return…a promise I always keep. 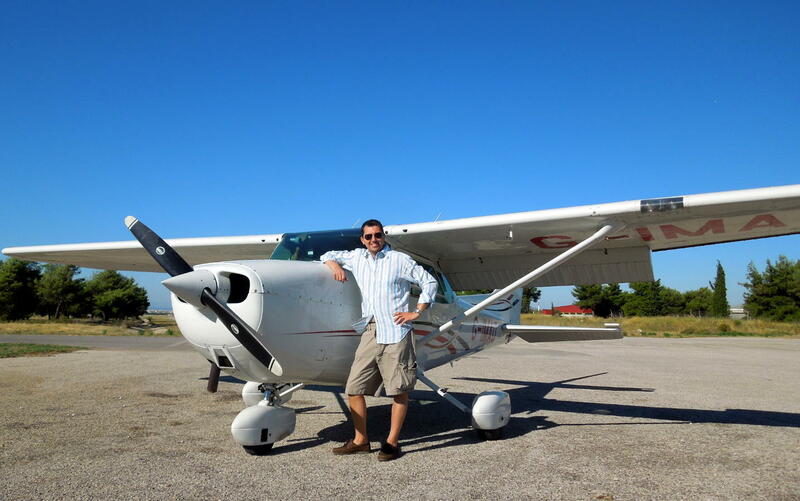 Dimitrios Myzithras has been passionate about flying since his early childhood. This he attributes to a noisy formation of F-4E Phantoms flying a few meters above his head in the Greek mountains, when he was 7. With studies in mechanical engineering and aeronautics, he enjoys reading about flying machines, almost as much as flying them cross-country. Really nice article! I was wondering, are there any clubs in Paros that rent out planes for PPL pilots?